United States Trade Representative Robert Lighthizer (left) speaks Tuesday at the end of the latest round of negotiations over the North American Free Trade Agreement in Washington, as Mexico's economy minister, Ildefonso Guajardo, looks on. When negotiators for the United States, Canada and Mexico wrapped up the latest round of trade talks in Washington on Tuesday, they sounded frustrated — and far apart. From cars to cows, they have big disagreements over how the North American Free Trade Agreement should work. In fact, the disputes appear so big, they may be threatening the future of NAFTA. So officials have agreed to delay their next meeting — pushing off its start in Mexico City until Nov. 17; they originally had planned to meet later this month. 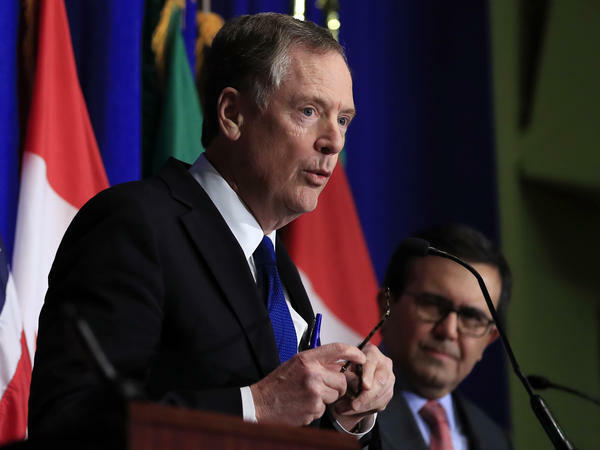 President Trump's top trade official, Robert Lighthizer, appeared at a dour press conference at the end of the week-long talks, standing along side his counterparts from Canada and Mexico. He said the terms of the pact must change because "it must be fair." But Canadian Foreign Minister Chrystia Freeland said the United States is trying to "turn back the clock" on trade relations with a "winner-takes-all" approach. She called U.S. demands "troubling." The U.S. backs a proposal that would allow NAFTA to expire every five years unless all three countries agree to renew it. Canadian and Mexican officials, along with the U.S. Chamber of Commerce, say such a "sunset" provision would create tremendous uncertainty and discourage investment. The U.S. also wants to change the rules determining how autos are traded among the three countries. Other disputes center on dairy products. NAFTA has shaped commerce on this continent for nearly a quarter century. But Trump has called it "the worst deal ever." So earlier this year, his administration initiated this series of talks to reshape the pact to make it more favorable to the United States. But Mexican and Canadian officials say the proposed changes reflect "America first" language that would make it harder for companies to move goods — such as auto parts — around the trade bloc. "Proposed new U.S. national content requirements would severely disrupt these supply chains," Freeland said. Freeland said she hopes that when officials next meet, they will bring a "fresh, creative perspective." And Mexico's economy minister, Ildefonso Guajardo, said: "None of us wants to leave this process empty-handed."